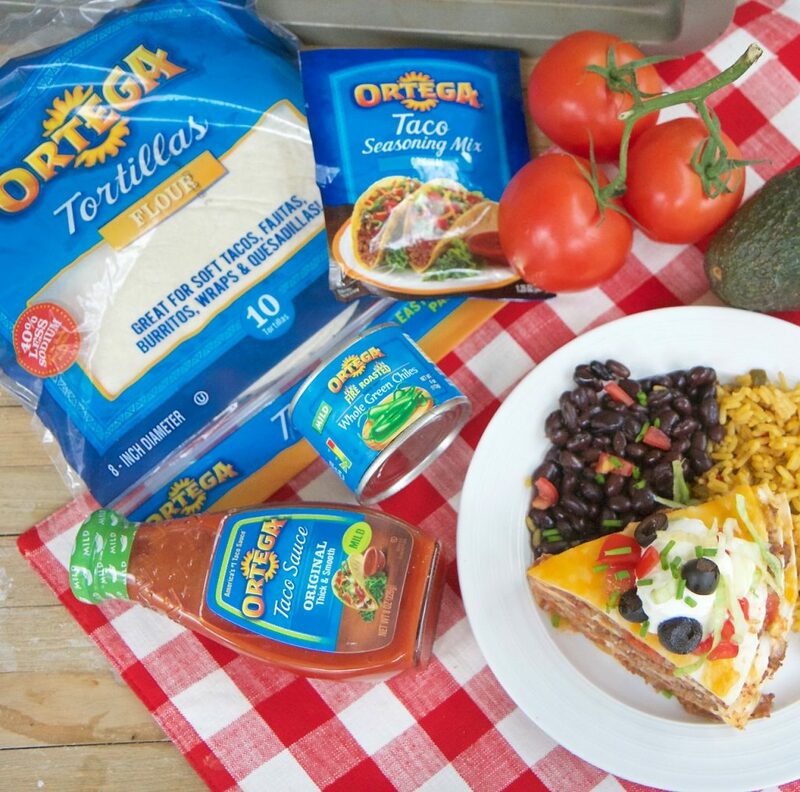 "For over 100 years, Ortega has been helping families (including my own) make festive Mexican meals at home using their creative shells, special seasonings, and flavorful skillet sauces!" This is a sponsored post written by me on behalf of Ortega. All opinions and text are my own. It’s almost Cinco de Mayo tiiiiiiiime!!! How do you celebrate? I keep saying I’m going to hit up one of my favorite Mexican restaurants. On Cinco de Mayo they have games, contests, a live mariachi band, free drinks flowing, the works! However, it’s always incredibly crowded, with minimal parking. Factor in the snaking wait line with my antsy children, and it’s enough to make me vote for at-home Taco Night! This year the boys and I are turning our regular Cinco de Mayo dinner into a Cinco de Mayo dinner party! I’ve been having so much fun planning festive games and decorations. Now it’s on to the menu! To help me pull off the menu for our Cinco de Mayo dinner party, I’ve teamed up with the makers of America’s #1 Taco Sauce, Ortega! 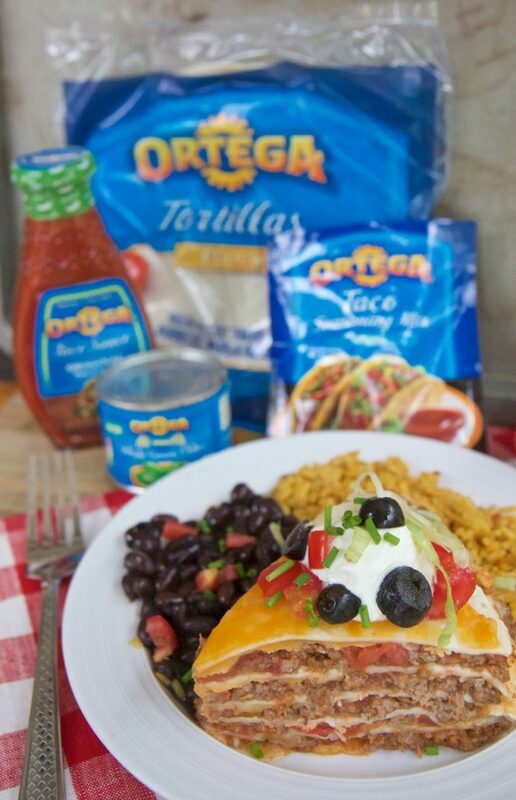 For over 100 years, Ortega has been helping families (including my own) make festive Mexican meals at home using their creative shells, special seasonings, and flavorful skillet sauces! 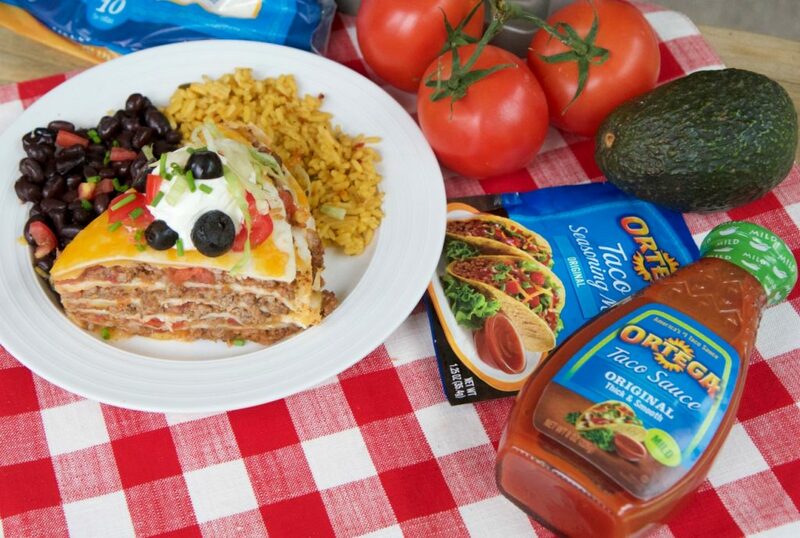 For Cinco de Mayo, I’m using Ortega’s tried and true products to make my families favorite, Mexican Taco Bake (also known as Mexican Tortilla Lasagna)! In this recipe, I used Ortega Taco Seasoning Mix, Ortega Mild Fire Roasted Whole Green Chiles, Ortega Original Mild Taco Sauce and Ortega Flour Tortillas. You’re not gonna believe how easy this recipe is! Mexican Taco Bake starts with ground beef seasoned with Ortega’s Taco Seasoning Mix. Ortega’s Mexican seasonings use a unique blend of spices to provide an authentic Mexican eating experience. 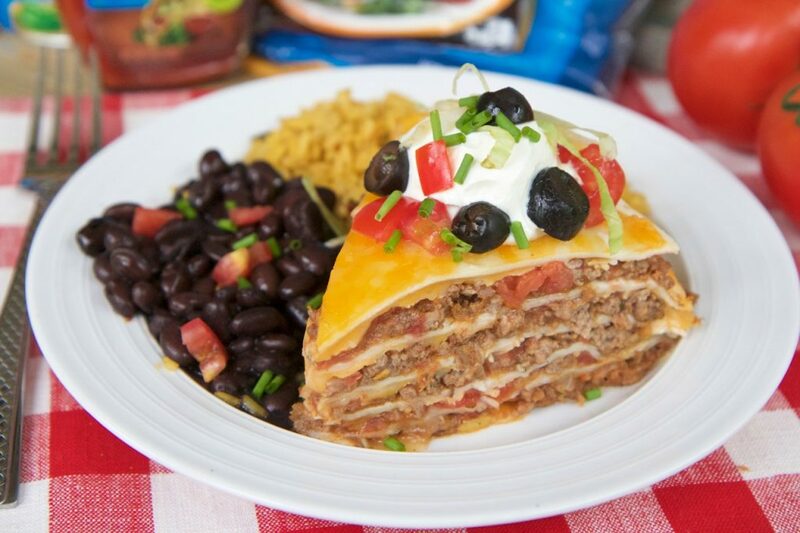 Once the beef is done simply layer it with fresh salsa and cheese between flour tortillas. After baking it to melt the cheese, you then load on your favorite fresh toppings like lettuce, tomatoes, green onions, sour cream, and black olives. That’s it! Yeah, now you see why it’s a family favorite, huh? It’s one of those dishes that looks way more complicated than it is. I can throw this meal together on a busy weeknight in 30 minutes or less. It’s also super easy to change up the flavor with this recipe thanks to Ortega’s extensive line of products. Try switching out Ortega’s Mild Original Taco Sauce for the Smoky Chipotle Taco Sauce or one of their delicious skillet sauces, like Ortega’s Cilantro & Green Chile Skillet Sauce. Add a side dish of Mexican rice and black beans and dinner is complete! Now all I have to do is find a live mariachi band, hmmm. I hope that you guys enjoy this recipe as much as we do! In a saucepan over medium heat brown ground beef. Drain and stir in water and taco seasoning mix. Simmer until liquid is dissolved. Stir in taco sauce and green chiles. Place a tortilla in the bottom of a 9-inch pie plate. Bake for 10-15 minutes or until cheese is melted throughout. Top with sour cream, lettuce, tomatoes, black olive, and green onions. Toast the tortilla lightly if you prefer a bit of a crunch to them.